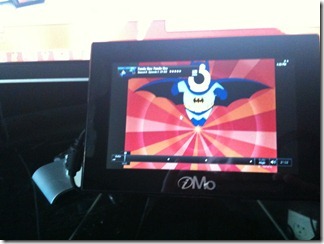 NOTE: This review was written using the DisplayLink 5.2.20937 Drivers on Windows 7 x64 RTM. Be sure to scroll to the bottom in their forums, as that's where the new stuff is. I switched to three monitors over two years ago and I can't go back. I replaced those CRTs with LCDs a year later when I rebuilt my home office and added a fourth monitor. I moved that fourth monitor over to my Mame Arcade Cabinet later and have been using a 24" and two 22"s ever since. However, then Twitter happened and darnit, I need another monitor. Maybe, hm, a tiny monitor. I could watch videos, Hulu, run Zune and all sorts of things. But is it cheap? Does it work? 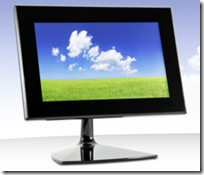 Can you run a monitor over USB? Let's see. 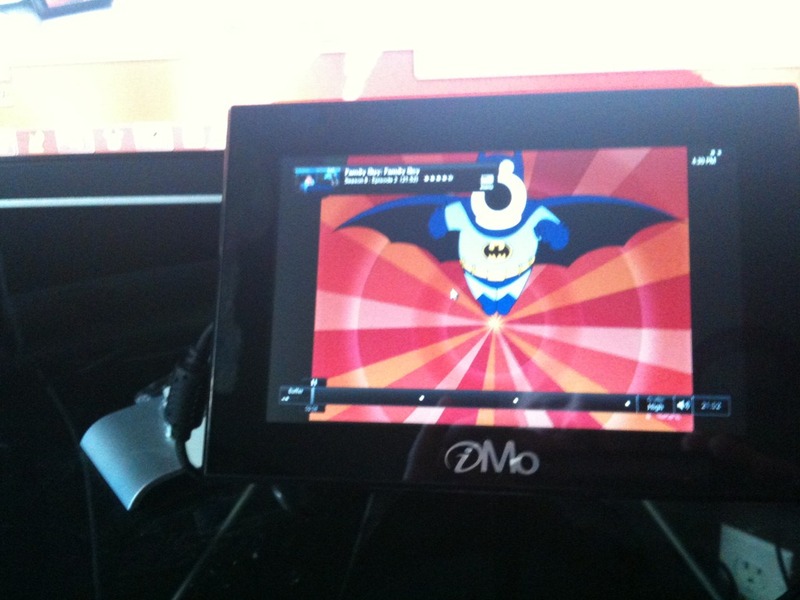 The idea is that the iMo Pivot is a 7" 700x480 portable monitor that uses USB as its buss. It works on XP, Vista and Windows 7, as well as Intel-based Mac OS X. It has drivers for all including 64-bit. There's also a touch screen version, but I bought the $129.99 Pivot version without a touch screen. It can stand horizontally or vertically (hence, iMo Pivot) or it can be removed and stand up like a picture frame with a metal support. I put mine underneath my 24" 16:9 monitor and while it's slightly dimmer (it has a 400:1 contrast ratio and 350 cd/m2) it's not a distracting difference against my bright Dell. It's a real monitor and shows up as an extra one (number 3 below) in your Control Panel. 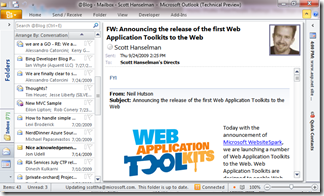 You could take Outlook and fold up the folders/calendars/toolbars and have a nice tidy place for your Email. Again, you've got 800x480 to work within. Also, you can use this as your Twitter screen, putting your timeline either on the web or using TweetDeck or bDule. Sometimes you just need a place to put your Watch Window. ;) While Visual Studio 2008 doesn't have the explicit support for Multiple Monitors like Visual Studio 2010, you CAN take your toolboxes and toolbars and move them over to your second monitor. 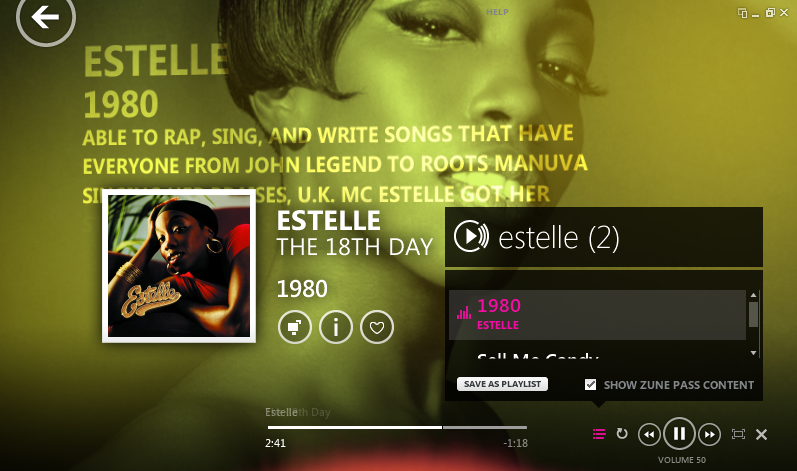 An interesting app that this is perfect for, although there were a few visual glitches is the Zune software. 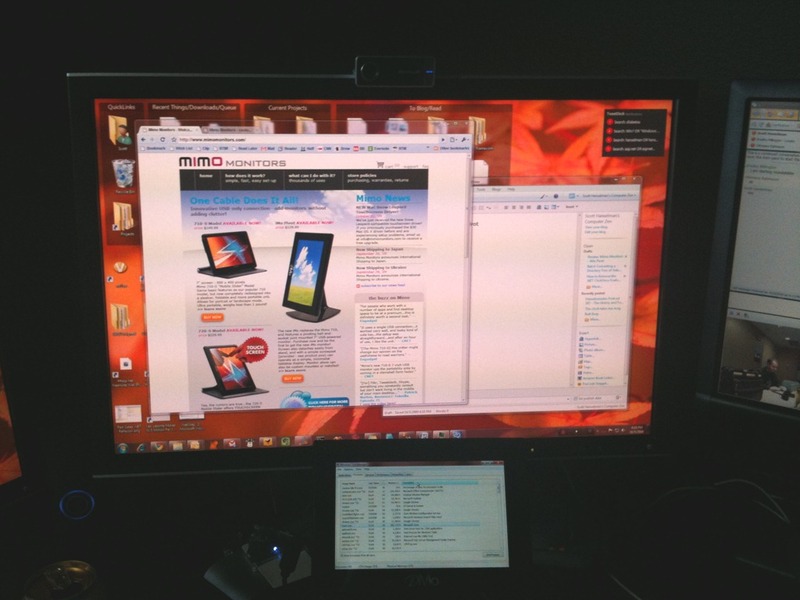 This little 800x480 monitor is a great place to park the Zune software and let it entertain you while you work, without using one of your larger monitors. Unfortunately, something about the Zune visualization being so "heavy" it causes the monitor to sometimes switch into a Video Optimized view. I only saw this with the Zune software and only once or twice, but the idea appears that you can set the iMo to favor framerate over clarity, so it'll switch seamlessly to 400x240 (basically big dots) when there's a LOT of fast pixels moving. Again, don't freak out, I don't think this is a big deal and I only saw it a few times. Also, you can CHOOSE to turn this on or off with their software driver. It works great for Hulu (sorry folks outside the US) and YouTube videos. There is an "optimized for video" option, but I haven't had to use it. More on that option below. I had no problem dragging an episode of Family Guy down onto the monitor, even using Hulu Desktop, and it worked seamlessly with minimal problem. It was smooth and watchable to the point where I was genuinely surprised it was all happening over USB. I could totally see using this to watch DVDs or little things in the background while writing, well, blog posts like this. Frankly, this is an amazing piece of hardware. It's $130 and it works exactly as advertised. I'm looking forward to taking it with me to conferences an using it as a countdown timer for my laptop while on stage! It'll be perfect as a second monitor in Hotel Rooms when I'm away from my "command center." This is a fantastic little monitor and I'm happy I bought it. Looks cool. How do you plan on using it as a countdown timer during presentations if you also have your laptop hooked up to the room's AV for projection on the screen? Do the drivers provide further graphics output options over and above the usual, clone vs. extend? Would be awesome if you could set your laptop up to clone the main display to the projector while extending to the Mimo. Thanks for the review! I'm thinking I might have to get one for myself! USB can do some pretty amazing stuff, I can run full screen HD video on to my 1680x1050 using my DisplayLink UV Plus+ 16...great alternative to those of us who have no room for a second video card. I so want on of them! 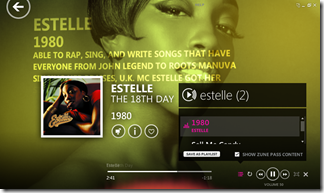 I was looking at the touch screen version which looks really cool. Does it work with aero? I though in Vista and Win7 all your video cards (and this is really just a software video card) have to run the same driver. That is why you can't mix ATI and Nvida Cards. Use something like WinSplit Revolution to size Visual Studio <=2008 tool windows. Works well on mini monitors. I have the standard Mimo. The disparity between the dot pitch still gets me a little. Mimo pixels are about 55% the size of my regular, full size screens makes switching back and forth a little straining on the eyes. Otherwise a good piece of hardware. Mine is mounted upside down above a main screen. Orientation seems to have no ill effects. Need to rearrange my desk though to make it more useful for development. @TonyB - Yes, it supports Aero. Scott - I'm comparing the specs/images of your model (the iMo) versus the one that I have, the 710 (which apparently the iMo replaces). Tell me, is the height adjustable on yours? Or does the stand just have that ball and pivot thing? If it's fixed height, what's the height? Also, is the screen glossy? Or matte? My 710 has adjustable height and a glossy screen. I'm a bit interested in knowing if the iMo has those as well. Dude, I have some carbon credits you may be interested in. I really like the look of those icons groups as well. The icon grouping functionality is made possible from a Stardock application called Fences. You can find it here. Careful you don't get too giddy and buy a screen per application! I am surprised that you don't notice a significant slow-down in your overall computer performance with a software video driver. Of course, you aren't playing games on the Imo! But both the video information and the USB bus are being CPU driven. No doubt, my problem is that my computer is 7 years old and has only one processor. My USB disk drives really make a dent in available CPU time. I haven't seen any slowdown, although it has locked up a few times overnight and I've had to unplug it and plug it back in again. I suspect their driver is pretty good about not worrying about the screen when it's not doing anything. All in all, even with some instability, it's been useful. And, it's easily turned off just by unpluging. Scott...I see that you're running this monitor via USB but you mention that you were up to 4 monitors at one point in the past. Was that using USB as well? Or what video card(s) R U using? I am a multi-monitor user as well. I only have two but I have it at work and at home so I successfully live in my own bubble without having to go back to single screens except for when somebody corners me to fix something. After my boss saw me swipe a spare monitor for this task he soon followed suit! The only bad thing about multi-monitor is the extra effort you have to go to with getting decent wallpaper! In fact thats something I never thought about - does windows 7 have per monitor wallpaper support? Great find! Looks like it'd be a great secondary display while traveling. I've had great results with the UVGA DisplayLink Display Adapter at work to handle a 3rd monitor. The only downsides I've seen so far is that it doesn't play nice with undock; I always end up having to reboot when I reconnect. Not really a big deal imho but something to note if you undock and dock a lot. Hi, I just received the imo touch and have had nothing but problems with it. The mac drivers didn't work and the touch function was...non-functional. I emailed tech support for help but they just referred me to the manual (to the section for Windows users although I told them I was using a Mac--the mac section of the manual is pretty sparse) and the manual is written in poor Engrish in parts. Then, I turned off the monitor over night and it never would turn back on again. I have to now pay out of my own pocket to ship it back and I am out the $30 custom fees. I dare not request a replacement because if that doesn't work, I'll be out another $30 or so in shipping. Frankly, I wouldn't recommend this product at all: the customer support is poor and you're on your own if something goes wrong. I may even get charged a 10% restocking fee! It's too bad because I was really excited about this little gadget and had some great plans for it. Just my opinion based on my personal experience, but I would definitely stay away--at least until they work the kinks out in a later version (as this was just released on Dec 3rd).